MULTI-TALENTED writer, actor and show runner Mindy Kaling told www.asianculturevulture.com that wanting to write a film for Emma Thompson lay at the heart of ‘Late Night’, her latest project – which had its world premiere at the Sundance Film Festival – just hours ago on Friday evening (January 24). She spoke to acv on the red carpet of the film which stars Emma Thompson and is directed by well-established US TV director Nisha Ganatra. ‘Late Night’ is about a famous TV talk show host (Thompson) who takes on Kaling playing (‘Molly’) after being pulled up for not having any female writers on her popular show. 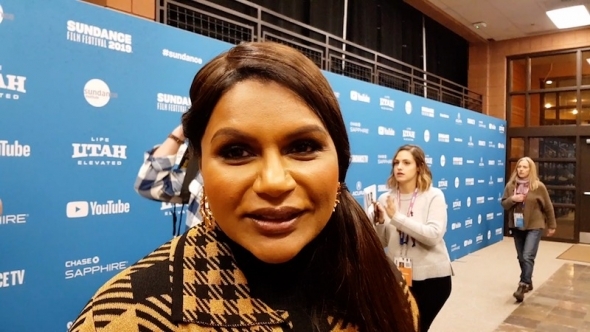 Kaling who first broke through as an actor and writer on the US version of ‘The Office’ told acv she has experience both of being a lowly writing hand, when she first came into the industry and then much later becoming a show runner and leading from the front with her very own, ‘The Mindy Project’. ACV also spoke to perhaps the youngest star of the film who told us she has some cool put down lines of her own in the movie. Jia Patel, who is 12, said this is far the biggest project she has ever been involved in, and plays ‘Paravti’, Mindy’s cousin in the film. She has to give up her room when Mindy moves to New York to write for Thompson’s talk show host. Reaction to the film appeared very positive – but there was a side issue as many ticket holders were not allowed in because the theatre was already full. Some got replacement tickets for today’s 9am screening at the Eccles Centre, Sundance’s largest venue that holds more than 1,200 seats. Earlier in the day, ACV attended Making the (In)visible – Radical Transparency in the data-drive age – a panel brought together to discuss diversity or the lack of it in the film industry. ACV also saw the Julianne Moore film, ‘After the wedding’. More on both these soon.